NCH313 Like a tree beside the waters (James Martin) Good congregational words of richness From the waters. Tune is a little bit tricky, so will need to be introduced. It can also be sung to the more familiar HYFRYDOL. *Online resource Like a tree by the flowing water (Richard Bruxvoort-Colligan) Lovely simple words of connectedness, and a simple chorus. Good for kids. Lyrics, sound sample and purchasing options. Linnea Good Strong as living Trees (Linnea Good) A lovely haunting chant. Good for kids and adults alike. NCH478 / VU577 / SFFS 2145 / HPP394 / PH368 / GGives1 / Cha530 / MP353 I've got peace like a river (African-American) I really like this old song! Good for kids. AoV2-070 / ATW 496 / MV090 / StJ Don't be afraid (John Bell) Excellent. I love this song of reassurance. Don't be worried that the water will run out - keep those roots deep. "Don't be afraid, my love is stronger. My love is stronger than your fear". This song can be used as a response to intercessions. Good for kids. Sound sample. They who trust in the Lord shall be like a tree planted by the water with roots in the stream and will fruit even in drought. *Online resource Blessed are those who trust in God / By the stream (Christopher Grundy) Oh my... this is just gorgeous! Best sung by a soloist for the verses. The recording is so beautiful - it's easy to pull my heartstrings with a cello and a mandolin... Youtube. Sheet music sample and purchasing options. NCH Psalter001 My delight is in the law of God (Judy Hunnicutt) A very simple refrain and chanted Psalm. *Online resource Like a tree by the flowing water (Richard Bruxvoort-Colligan) Part of a series of songs based on Psalm 1, I think the chorus of this is probably my favourite. In Australia, you might want to use only the chorus because the word "rooted" means something quite different over here. Sound samples, lyrics and purchasing options. Good for kids. CP462 The hidden stream that feeds (Thomas Troeger) Good for the end of the service "We leave this watered place to work on rocky ground, Yet even there the streams of grace sustain our daily round. Lord, through our lives may others hear your living waters drawing near." NCH438 / UMH377 / LBW346 / ELW785 / HPP390 / GtG840 / W&R428 / Cha561 / Srce784 / MP757 When peace like a river / It is well with my soul (Horatio Spafford) An older American hymn. 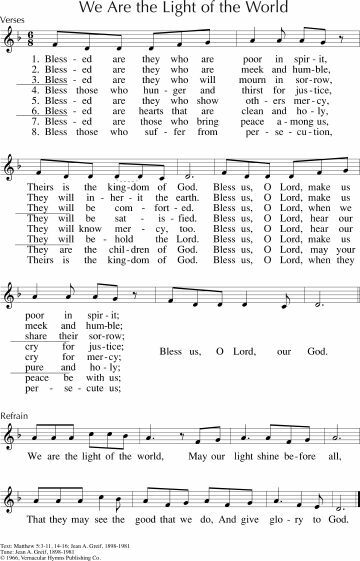 Hymnals vary in how old fashioned the lyrics are, and only some include the chorus. Lyrics and tune. A nice recording by Audrey Assad. PfAS001E How blest the people (Juan Espinosa) This will take a little while to learn, but the chorus is very simple, so perhaps use a cantor to sing the verses. TiS 1 / PfAS001C Happy are they who walk in God's wise way (Erik Routley) Excellent tune from Thailand. Words are a reasonable paraphrase and slightly old fashioned but quite fine. 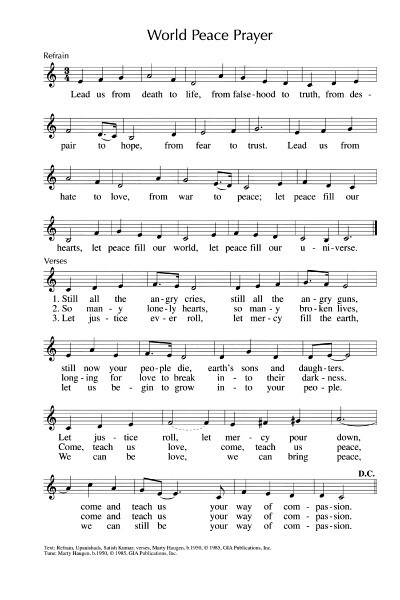 PfAS001F / URW224 Happy is the one (John Bell) Quite straightforward and good hymlike paraphrase of the Psalm. Youtube. TiS 380 / AHB 303 / NCH253 / CH419 / UMH308 / VU173 / LBW145 / ELW376 / A&M218 / HPP203 / GtG238 / PH122 / CP210 / CP(E)160 / W&R310 / Cha218 / Srce694 / Lau287 Thine be the glory risen conquering Son (Edmond Budry) One of the few older hymns that doesn't require updating, and beautiful harmonies... A great classic hymn! Lyrics and tune. Oldy-but-a-goody. Iona (Love From Below) / CH434 / CP232 Jesus is risen from the grave (John Bell / Graham Maule) Good, simple rhythm and tune. You can even make up some verses if you like. Good for kids. Music by heart 43 Dying you destroyed our death (Marilyn Haskel) A very simple round of Christ's death and resurrection. TiS 367 / AHB 287 / NCH242 / CH412 / UMH306 / VU159 / LBW135 / ELW366 / A&M217 / GtG236 / PH119 / GC446 / GC(II)459 / G(3)525 / CP212 / CP(E)159 / W&R290 / Cha221 / 82Hml-208 / Lau275 The strife is o'er the battle done (Francis Pott) There are two possible tunes for this hymn. I prefer to sing it to the tune by James Minchin (THE STRIFE IS O’ER), which is found in the Australian Hymn Book, rather than the more traditional minstrellish VULPIUS. The newer tune is pretty groovy (I loved it as a kid! ), and has lots and lots of alleluias. The words also vary a lot between hymnals. So, the best would be a combination of the TiS words and the AHB tune 287 (ii). Yeah, this was my other church rock favourite of 1979. New words to old tunes. The other Beatitudes; those ones that include the woes! StS041 / GC(II)515 / G(3)592 / Lau817 Blessed are they who are poor in spirit / We are the light of the world (Jean Greif) Yep. Okay! Would be best with a cantor, or small choir and the congregation can respond with the chorus. You could even do this instead of the reading. Sheet music and lyrics. Sound sample. Iona (L&A) / ATW 436 / MV112 Amen amen it shall be so! (John Bell) A beautiful chant. Works well with a cantor or small choir leading the verses and the congregation joining in on the “Amen, amen it shall be so, amen, it shall be so”. Sound sample (look for the green button). This is based on the Matthew version, but would also work here. W&R640 From Miles Around the sick ones came (Jane Marshall) Good song calling us back to our purpose to stand with the suffering. Lyrics are quite formal and poetic. Lyrics and sheet music. *TiS 697 All the sleepy should have a place to sleep (Rusty Edwards) Great chorus "Make love happen by God's grace and by God's power. Let God move you on this day and in this hour. New creations will then blossom like a flower for together we can be the hands of God". STB260 Hope For The Children (Douglas Clark) Lovely hopeful words for peace and justice for the world's children. Sung to a simple Taiwanese-style tune. *Taize How blessed are you who are poor the kingdom of God is yours (Taize) A lovely simple chant. Sheet music sample. *Iona (I will not sing alone / HSNW) Blessed are the ones I call the poor / Hey my love (John Bell / Graham Maule) A lovely lilting tune (LADY MAISY). This gentle song would be good for a reflection. Sound sample. TiS 288 / Iona Not the powerful not the privileged (John Bell) I think it is close enough to Christmas that this song can still be sung in February? Cha185 Blessed are the poor in spirit (Anon) A simple response to the Beatitudes which can be read responsively with this refrain. Online Resource / Tune In: Kingdom Come (Matthew Lees) A song about how things are not what we expect in God’s kingdom. Lots of words and good images including "there's no blacklist or admission fee" Sound sample and lyrics and free downloadable songbook. HiOS074 If you shut your eyes (Colin Gibson) Powerful words to a lovely tune (SONG OF THE POOR) calling us to wake up and stand with the poor. What ideas do you have? Please share them in a comment below, especially if they are songs about the woes! Beauty for Brokenness, by Graham Kendrick (TiS2 #690). Chorus: "God of the poor, friend of the weak ..."
It occurs to me that Sylvia Dunstan's hymn "All who hunger" would be a good hymn for any churches including Holy Communion this week. - It's three verses go well with the three part structure of Luke's Beatitudes and it shares the key idea of our emptiness being filled with God's grace. The words are here: http://static1.squarespace.com/static/546d04cee4b072f456a9cdb3/t/5747eb8e37013bbe41807203/1464331150421/303+all+who+hunger.pdf and the suggested tune of Holy Manna isn't too hard to learn. In Babilone would work too, or one of the other wonderful 8.7.8.7D hymn tunes.